SMEs, Mobile Technology, Small Businesses. The South African government has been adopting economic policies whose main focus is on economic development that results in the creation of employment and alleviation of poverty (National Department of Economic Development, 2010). This is due to the slow growth in the economy which results to the country’s failure to reduce unemployment levels, poverty and income inequality. Statistics South Africa (Stats SA) has released unemployment data that shows minimal improvement over the years and also revealing that South Africa is currently facing the worst levels of unemployment since 2008. According to Stats SA, unemployment rates for the past 10 years (2008-2017) have remained relatively the same with a slight trend upward (Statistics South Africa, 2017). Consequently, the small businesses sector features profoundly in most of the government policies as it recognises the importance of this segment of the economy in the overall economic growth of the country. This sector finds itself at the centre of government’s strides as it is believed to have the potential to bring about economic growth that is inclusive, sustainable and empowering to South Africans through its potential to create jobs (National Planning Commission, 2011). Moreover, the sector has been identified as an essential enabler that would propel the country’s economic pursuits forward (Cooperative Governance and Traditional Affairs, 2014). As a result, the government targets that 90% of job opportunities are to be created by the small businesses sector by the year 2030 (National Planning Commission, 2011). There has been an explicit intention and a deliberate drive by policy makers to promote the small businesses sector in order to ensure that it continues to contribute optimally to the growth of local economies and the South African economy at large. Nonetheless, there is still a lot of work to be done in terms of capacitating small businesses and setting them up for success (Herrington et al., 2016; Eriana et al., 2018). According to the Global Entrepreneurship Monitor Report (2016), South Africa currently has a relatively weak small businesses sector in comparison to its African counterparts and global economies (Herrington et al., 2016). More worryingly though is the high failure rate in small businesses as it is reported that more than 65% of small businesses in South Africa fail within the first 2 years of inception (SBP Alert, 2014). At the backdrop of this, it is imperative then that researchers look into the factors that contribute to the success and failure of small businesses so that efforts and resources can be prioritised accordingly. In the same manner, the purpose of this study is to determine how the accessibility to and the use of mobile technology impacts the daily operations of small businesses and explore the role played by mobile technology in the potential success of small businesses in South Africa. The research focused mainly in the City of Johannesburg as it is the highly entrepreneurial city in the country, with a specific focus in the area of Noordwyk in Midrand (Bureau for Economic Research, 2016). In the context of South Africa, the National Small Business Act of South Africa of 1996, governs the administration of the small businesses sector. The Act defines small business as a “separate distinct business entity, including co-operative enterprises and non-governmental organisations, managed by one owner or more which, including its branches or subsidiaries, if any, is predominantly carried on in any sector or subsector of the economy” (Republic of South Africa, 1996). This Act classifies the businesses in the SME sector into four different categories, namely: micro, very small, small or medium enterprises. 1. Total number of full-time, paid employees. 3. Total gross assets value (fixed property excluded). Furthermore, the criteria vary according to the sector or sub-sector in line with the Standard Industrial Classification. Referring to Annexure A, a business is considered “micro”, regardless of sector, if it either has five or less full-time employees on its’ payroll or has a total annual turnover of R.150 000 or less or has a total gross asset value of R.100 000 or less (Republic of South Africa, 1996). This paper focuses on businesses that are classified as “micro” and “very small” because, according to the Global Entrepreneurship Monitor (GEM) Report (2016), “micro” and “very small” sized businesses represent the size of an average start-up business in South Africa (Herrington et al., 2016). This becomes of paramount importance in this paper as it relates directly to Local Economic Development. More than 60% of these businesses are started on the basis of opportunity and generally employ people in the area at which the business operates and that often fosters the development of the local economy (Herrington et al., 2016). For the purposes of this research, mobile technology can be defined as “a portable, handheld communications device connected to a wireless network. It allows users to make voice calls, send text messages and run applications” (Sharon, 2007). This paper will refer to mobile technology such as, laptops, tablets, smart phones and landline phones. The study focuses, in particular, on mobile technology and its uses within the context of business purposes i.e. where mobile technology is used to promote success in small businesses. According to Baumol (2006), the small businesses sector has been significantly contributing to the economy of South Africa (Baumol, 2006). This is also supported by Van Scheers (2016) that the success of small businesses has a positive impact on sustainable economic growth in South Africa and therefore the development of small businesses should be encouraged (Van Scheers, 2016). Their contribution is not only through providing a way out of poverty many, but Van Scheers (2016) also highlights that small businesses contribute about more than a quarter towards the country’s GDP (Baumol, 2006). However, there is additional literature that suggests that entrepreneurship plays a smaller role in the economic growth of developing countries as opposed to highly developed countries (Wennekers et al., 2005; Cravo et al., 2012). Cravo et al. (2012) in their study of small businesses and regional economic growth in Brazil concluded that the relative importance of the size of small businesses is negatively correlated with regional economic growth; however, this was not surprising as Brazil is a developing country. They do mention further that their conclusion does not necessarily mean that small businesses should be but it simply means that some other factors, such as institutional failures, should be considered when promoting small businesses (Cravo et al., 2012). A similar conclusion was reached by Larroulet & Couyoumdjian (2009) in their quest to investigate the paradox of entrepreneurship and growth in Latin America. They were observing high levels of entrepreneurship in the country but with unexceptional rates of economic growth and it emerged in their report that the reasoning behind this irony was that even though there were high levels of entrepreneurship, there were lower proportions of productive entrepreneurship. Productive entrepreneurship is a form of entrepreneurship whereby entrepreneurs are motivated by opportunity and thus is best able to promote economic growth when compared to other forms (Larroulet & Couyoumdjian, 2009). Small and medium enterprises contribute to the economy mostly through job creation, however, it is important to realise that “high growth” small businesses contribute more to economic development than typical start-ups (Ngek & Smit, 2013; Larroulet & Couyoumdjian, 2009). South Africa still experiences low levels of entrepreneurial activity, high failure rate of small businesses and high unemployment rates. Therefore, even though there is massive contribution from small business sector, the government would need to identify small businesses with high growth potential and provide support for their growth (Ngek & Smit, 2013). It is important to bear in mind that, though small businesses and entrepreneurship are interrelated, they are not identical concepts. Entrepreneurship relates to the type of behaviour that concentrates on opportunities rather than resources and therefore small businesses can be viewed as “vehicles for entrepreneurship” (Thurik & Wennekers, 2004). Mobile technology influences the success of a small business in two ways. Firstly, it is in the way it help with simplifying administration tasks in the business. Mobile devices provide convenience as they simplify access to business documents and financial records for as and when the business owner requires them (Agwa-Ejon & Mbohwa, 2006). Secondly, by making communication and marketing easier and more affordable (Agwa-Ejon & Mbohwa, 2006). Its capability to access the internet through applications provides cost effective platforms, such as websites and social media, for communication and marketing. Websites and social media allows small businesses to have a “global reach” through marketing, promoting and advertising when they would otherwise not have the financial resources to use traditional marketing tools (Jones et al., 2015; Hanna et al., 2011). Efficient use of mobile technology for small business boosts the prospect of success for a small business (Chew, 2012; Frempong, 2009). According to Agwa-Ejon & Mbohwa (2006) technology has a direct positive impact on small businesses in the Gauteng province. It affects them in two distinct ways, namely, through productivity and competitiveness. They explore the idea that technology enables small businesses to improve administration, communications and processes through automation. This in turns gives small business that are technology-led a competitive edge (Agwa-Ejon & Mbohwa, 2006; Abdullah Umar et al., 2018). of success for that business. He concedes that business growth is a function of both the use of mobile technology for business processes and entrepreneurial intent to grow the business. Therefore, mobile technology does not, in itself, promote growth but must be used in relevant and useful ways. He argues that the role played by mobile technology in the success of a small business depends on three things, namely, the nature of the business, the sector it operates in and lastly, the strategy of the business (Chew, 2012). The nature of a business relates to whether the enterprise is growth-oriented or not. He argues that mobile technology is more useful to a growth-oriented small business than to one of a different nature (Chew, 2012). As such, the higher the culture or ambition for growth, the higher the use of technology (Agwa-Ejon & Mbohwa, 2006). This relates to the business development life cycle which shows that when a business is in “growth stage” it tends to be more efficient in its use of mobile technology. 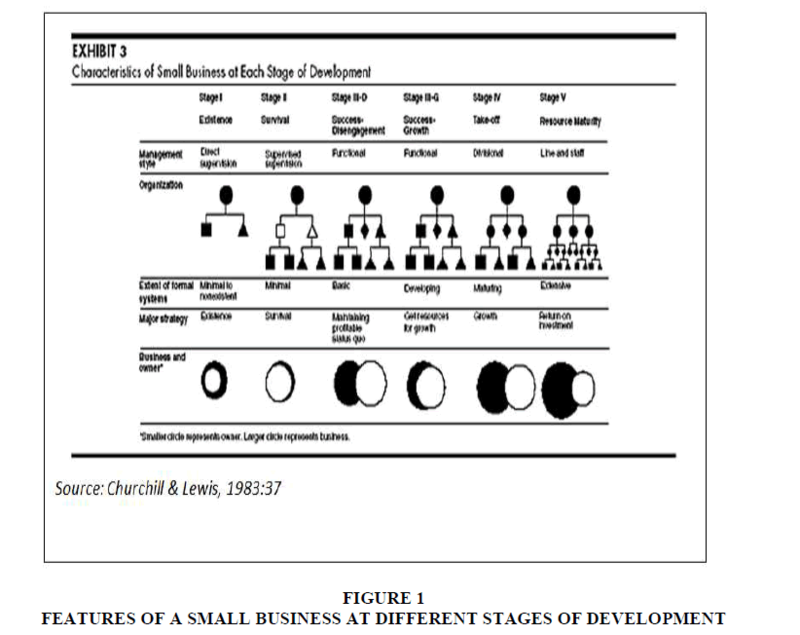 This is according to Churchill & Lewis (1983) in their analysis of five stages of small business development as illustrated in Figure 1. They argue that at the survival stage is characterised by systems development and use that is limited and formal planning that is minimal. The major goal is still survival, the owner is inseparable with the business and earnings on invested time and capital are marginal (Churchill & Lewis, 1983). At this stage of the business, communication is limited and therefore this renders the communication advantages of mobile technology seemingly useless or ineffective (Chew, 2012). Secondly, the sector in which the business operates also determines the impact the use of mobile technology has on business success. The services sector, for instance, might make intensive use of mobile technology to communicate with customers and suppliers as opposed to products-based businesses. And lastly, the business must be deliberate and strategic in its use of mobile technology in order to reap the rewards, especially when using it for business purposes (Chew, 2012). However, Bao et al. (2011) argues that there are still limitations to the extent to which mobile technology affordances can be maximised. For example, they identify the fact that smart phone screens are much smaller than normal computer screens which makes it more complicated to promptly process or read through large amounts of information. Furthermore, in the context of running a business, even with the use of hard keyboards and word completion algorithms, typing can still remain onerous on phones. These difficulties could explain the reluctance of business owners to use emails or read documents on their phones (Bao et al., 2011). Bao et al. (2011) additionally claims that security mechanisms pose big barriers to mobile technology usage by small businesses. The security controls that are required to protect business records in the mobile device are often arduous as many businesses need complex alphanumeric passwords to safeguard their proprietary information. As such, entering passwords may be particularly complicated on smart phones, potentially leading to users avoiding the use of mobile devices for business purposes (Bao et al., 201). Another limitation is the costs associated with the buying of mobile technology hardware and access or use of it. These costs include subscription costs, the cost of mobile devices and the cost of mobile data and airtime. These have been identified as being a major hindrance to access and usage of mobile technology. This is because small businesses may not have financial capacity to invest in mobile technology for its employees, coupled with the stringent sim card registration processes that require physical address, identity documents and a postal address (Frempong, 2009). This is seconded by James & Versteeg (2007) in their research when they concluded that “the real break-through of mobile telephony in Africa has been the introduction of pre-paid services that do not require monthly payment, but make payment dependent on usage” (James & Versteeg, 2007). Despite the fact that sim registration is a hindrance to accessibility, pre-paid subscriptions are attractive to people with low or intermittent incomes since getting a prepaid subscription does not require a bank account or a minimum fixed monthly subscription fee (James & Versteeg, 2007). This is further echoed by Nyandoro (2016). In his study in Kenya, he reached a conclusion that the main barrier to the acceptance of technology by small businesses in general, among others, is the cost of technology (Nyandoro, 2016). Doody and Bailey (2016) mention fundamental aspects that have to be considered when identifying research objectives, most importantly, that research objectives should be specific and closely related to the research question; that they should cover all aspects of the problem, must be ordered in a logical structure, feasible and should take into consideration the available resources (Doody and Bailey, 2016). The main objective of this research is to identify whether small business owners in South Africa (mainly Noordwyk area) have access to and make use of mobile technology in the running of their small businesses and the impact thereof. Seeking understanding in relation to the factors that contribution to the success of small businesses is paramount in view of the intention to build a thriving and sustainable small businesses sector in the country, especially given the high failure rate of small businesses in South Africa. When it comes to research questions, Saunders et al. (2016) suggests that it is often best to write research questions by first identifying one research question that directly relates to the research topic. This may lead to more particular questions or even to the compilation of research objectives (Saunders et al. 2016). 1. What is the role played by mobile technology in the running and potentially the success of small businesses in South Africa? 1. Do small business owners in South Africa have access to mobile technology? 2. Do small businesses in South Africa make use of mobile technology to conduct their businesses and, if so, in what ways do they use it? 3. What is the contribution of mobile technology to their business activities i.e. how their businesses are managed on a daily basis including communications, branding and marketing etc. 4. Does the use of mobile technology have a positive contribution to the potential of success of the small businesses? These questions were posed in this manner so that they are able to guide the direction of the investigation. The study followed positivism as a philosophical approach. Positivism can be defined as “the position that all true knowledge is scientific and should be pursued by scientific methods” (O’Leary, 2007). Positivists decisively believe in the scientific technique and perceive the objective of research as describing physical data by means of observation and measurement (O’Leary, 2007). It is a philosophy that generally refers to where ‘sense’ or intuition is given as a tangible source of knowledge. This suggests that the frequency is an indicator of importance-the more a phenomenon transpires, the more likely it is non-random and therefore significant. For example, the more a small business used the mobile device in the operations of the business, the more they get exposure and growth (Lacity & Janson, 1994). The results were then interpreted using this approach and as such, occurrences with higher percentages were regarded as important and indicative of underlying relationships. Kvale (1992) states that in a research discourse, qualitative and quantitative approaches may interact (Kvale, 1992). The report employed both approaches in that the study itself is exploratory in nature because it envisaged investigating the impact of mobile technology access and usage in small businesses of South Africa through the use of a pilot small sample of 90 small businesses in Noordwyk. This study was conducted to investigate a phenomenon that has not been studied in the country, with an intention of establishing priorities that would best suit the research design, data collection and analysis. It is upon this explorative design that the descriptive statistical analysis was used to best analyse the results. Microsoft Excel was then used to analyse the data once it had been captured and categorized. Surveys were used in the collecting data for the report and a questionnaire was used as an instrument. Conducting surveys using questionnaires is a popular strategy as it allows for the collection of standardised data from a sizeable sample, allowing easy comparison (Saunders et al., 2016). This questionnaire was designed and used to collect data relating to: i) business owner information i.e. that related to the demographics of the business owners being interviewed. The questions ranged from gender, cultural group, language, age group and language used in the business. These questions were important to give insight to the study in terms of the demographics of the business owners that participated in the study, which, in turn, gives more understanding into the characteristics of the participants; ii) business operations information, this set of questions sought to obtain information about the business itself i.e. type of business, form of business, industry the business falls into, how long the business has been in operation and staff composition. The objective of including them was to gain background and characteristics of the businesses that participated; iii) mobile technology accessibility i.e. do they have mobile devices (laptops, smart phones, tablet/iPad or office phone), what brand do they use, what service providers do they use and also the participants were requested rate the service they receive from the service providers. Some of the questions related to the cost of mobile device, data and airtime/minutes so as to determine whether affordability plays a role in the access of mobile technology; and iv) usage of mobile technology in the operation of the business, these questions focused mainly on the different functionalities provided by mobile technology that business owners make use of in their businesses i.e. calling, messaging, email, social media, calendar, banking and maps or GPS functionality. Furthermore, questions relating to the business owner’s perception of the importance of mobile technology to the effective running of their business were included also. The small businesses that participated in the survey operate within the Noordwyk area in three Shopping Centres in the area. Noordwyk was chosen as the area of interest as it was the most easily accessible to the researcher, being a resident of Noordwyk herself. The population of small business owners in Noordwyk is not of manageable size and thus it would have been impractical for the researcher to even attempt to survey the entire population. Furthermore, budget and time constraints prevented the researcher from surveying the population. These constraints thus rendered sampling as an effective alternative instead of a census (Saunders et al., 2016). The sample was selected with no pre-defined criteria so as to ensure that the sample is not biased in terms of gender, line of business, size of business, ethnicity etc. The small businesses were randomly selected for the purpose of surveying them. Saunders et al. (2016) explains that the response rate can be calculated as follows (Figure 2). In the case of this research, the response rate was 44.3%. This means that there is no data on the experiences of more than 50% of Noordwyk small business owners in relation to mobile technology, and as such, the findings of this research cannot be generalised for the entire population. It was imperative to ensure that the research was undertaken with certain ethical considerations in order to protect the rights of participants. No participants were included in the research without their consent and none of the participants were obligated to answer any of the questions. All data was treated with confidentiality such that no one else will have access to the data except those gathering it and those directly involved with its analysis thereof. Furthermore, surveys were done such that they allowed for anonymity in applicable cases as no individual or businesses were obligated to identify them. 1. The demographic overview of business owners that were surveyed. 2. Their access to mobile technology. 3. Their use of mobile technology. A majority of small business owners among those that participated in the survey are males with 56%. About 44% of them being females; the marginal gender gap perhaps is an indication that the interventions by the government and other bodies in our society that seek to empower women into entrepreneurship may be yielding fruit. This level of female-led businesses is aligned to the findings of the GEM report (2016) which found that at national level, South Africa displays a healthy level of gender equality when it comes to entrepreneurial participation. In 2016, for every ten male entrepreneurs there was more than seven women who were engaged in entrepreneurship, this is in line with the averages for both Africa and for the efficiency-driven economies (Herrington et al., 2016). The results also showed that Africans make up 69% of small business owners in Noordwyk, an overwhelming majority. They are followed by whites, who make up 16% and Indians/Asians who make up 15% of the small business owner population of Noordwyk. There were no coloured business owners that participated in the survey. This is illustrated in Figure 3 above. More than 35% of these business owners are not South African nationals, as shown by Figure 4 above. They come mostly from various African countries. It is not surprising that Zimbabweans comprised of about 13% of respondents, given that, according to 2016 Community Survey, it was found that Zimbabweans are the largest group of immigrants living in South Africa (Statistics South Africa, 2016). The survey recorded about 133 devices being owned and used by small business owners in Noordwyk. This means that one business owner has in their position a staggering 3.4 devices, on average. 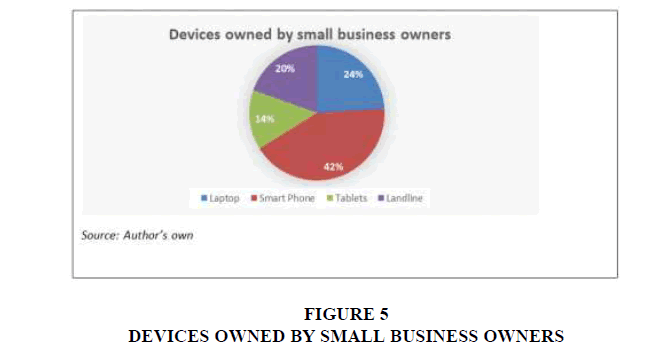 As illustrated above (Figure 5), smart phones make up 54% of mobile devices that are owned by small business owners in Noordwyk. Bao et al. (2011) argue that the rapid innovations in smart phone capabilities have presented new opportunities for mobile information access and computing and are thus the most commonly used mobile devices (Bao et al., 2011). Put differently, for every 5 mobile devices owned by small business owners, there is a high probability that 2 of those are smart phones. The second most common device among small businesses in Noordwyk is the laptop. About a quarter of all mobile devices owned are laptops, followed by office phones and tablets at 20% and 14% respectively. These statistics provide an indication that most of small businesses in Noordwyk have a resounding access to mobile technology. Out of the 133 mobile devices, about 63% of them are linked to prepaid subscriptions as opposed to contract subscriptions. This comes as no surprise since the majority of these businesses are fairly new, prepaid subscriptions enable them to pay as they use which is advantageous for small businesses that may not have the steady cash flows. Samsung was the most popular brand across the four different mobile devices i.e. laptops, smartphones, tablets and landline with more than 40% of all devices owned by respondents. This was followed by Apple which was recorded as the second highest provider of smart phones and tablets, specifically. Neotel and Telkom were the main providers of landline devices for the respondents, these two brands accounted for 11% and 8% of all devices owned by business owners who participated in the study, respectively. Vodacom was the most popular network provider with 44% of subscriptions; this is reflective of Vodacom’s current estimated market share of more than 50% according to both The South Africa Mobile Report 2017 and MyBroadband 2016 Technology Survey. Moreover, in line with these reports, the survey recorded MTN as the second most popular service provider with 20% of devices subscribed to the provider, followed by Neotel, Telkom and Cell C sitting at 13%, 12% and 11% respectively. A prevalent perception of respondents indicates that they think that data and airtime are expensive with 30 out of the 39 respondents having this perception; this is illustrated in Figure 6 above. This could potentially be a hindrance to the profitability of the small businesses as data and airtime could most likely be major operational costs to the business. However, there was a small percentage (13%) of them indicating that data and airtime is quite reasonable. An interesting phenomenon to note though is that the 4 respondents who indicated that they think data is cheap are, in fact, all Cell C users. The newest generation of mobile technology supports complex multi-touch input, gesture-based interaction, progressive soft keyboards, improved connectivity, and a countless number of dedicated special-purpose applications (Bao et al., 2011).These features enable the user to exploit the innovative computing capabilities through the built-in or standard applications, that are mostly free as they come already installed in the device. Below are various functionalities that are commonly used by small business owners in Noordwyk. As shown in Figure 7 below, respondents indicated that they use the banking functionality on their mobile devices 91% of the time, on average. Banking applications empower small business owners to track transactions i.e. debit orders, to make and receive payments and manage their accounts and/or statements of the business. If the bank application is advanced enough, even some minor accounting can be done. Emailing and Calling were the second most frequently used functionalities on mobile devices by small business owners in Noordwyk. With 65% of the time on average, these business owners communicate with their clients, suppliers or even potential clients through the use of emails or calls on their devices. This percentage was mostly prevalent among the “service” type of businesses unlike product-based businesses who used more of the marketing tools like social media rather than the communication applications. Respondents further indicated that they use the calendar function on their devices for scheduling appointments and meetings or setting reminders for about 63% of the time on average. They also make use of texting applications like WhatsApp as a tool of communication more than half the time. The least used functionality was SMS’s which seem to be used more for advertising promotions or specials but not as a tool for two-way communication with clients or suppliers. The majority of respondents indicated that they use social media for marketing purposes about 54% of the time on average. The small businesses are utilising these avenues to communicate and advertise their services and products to existing and potential clients. Furthermore, social media can also be used as a platform to study the public sentiments and perceptions on the business. Referring to Figure 8 above, Facebook is the leading social media platform with more than a third (37%) of the respondents suggesting that they utilise it more often than the other platforms, on average. This finding is no surprise because Stelzner (2016) found that Facebook was the most important social network to marketers by a big margin. In addition to that, more than 60% of marketers plan on using Facebook more for their marketing activities (Stelzner, 2016). 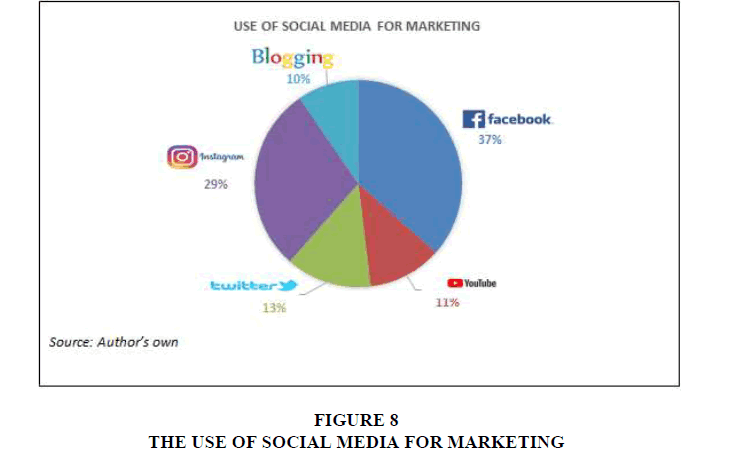 Additionally, according to the SA Social Media Landscape report published by World Wide Worx (2014), the study that involved a survey of major South African brands, showed that a large majority of these brands were using Facebook as their main social media tool (Fuseware, 2014). Facebook has become the most popular social media platform because of the growth in the numbers of users and thus offers a wider reach to the audience intended. From 2012 to 2016, the number of users has grown from 6 million to 14 million users in South Africa and this is by far the biggest growth across all social media platforms in the country (Bluemagnet, 2016). Instagram was the second most commonly used social media platform with 29% of respondents using it more often than Twitter, YouTube and blogging with 13%, 11% and 10% respectively. Through the use of these platforms, small businesses are able to reach to an ‘unlimited’ market online that could potentially create more businesses for them. The last set of questions in the questionnaire was deliberately designed to assess small business owners’ perceptions on the importance of mobile technology in relation to their business as this was the main objective of the research. The data gathered show that 97% of the respondents indicated that the availability of signal or network on their mobile devices is very important to the effective running of their businesses. Furthermore, the results reveal that 92% of them conceded that the price of mobile devices and data or airtime is very important to the daily operations of their businesses. Additionally, 87% of respondents acknowledged that mobile devices were very important to the marketing and branding of their businesses with only about 13% rating mobile devices as indifferently important to the marketing of their businesses. Lastly, all 39 of the respondents i.e.100% of the participants agreed that they think that the use of mobile technology for their businesses enable them to succeed because it plays a critical role in the operations of their business. Some of the participants went to the extent of saying “they literally run their businesses on the mobile device”. 1. That the South African government should consider focusing its intervention programs and resources more on “growth-driven” businesses. This is not to say that subsistent entrepreneurs should not be promoted or supported but the State must be intentionally precise about the “type” of entrepreneurship it is promoting and to what end. 2. Government can, perhaps in collaboration with network providers, subsidize small business owners with regards to costs associated with the use of mobile technology. If these subsidies are given to established small businesses, they would be a good alternative to “funding or cash” injections that are generally given to start-ups whose future may be highly uncertain. Due to the size of the sample used in the technical research, the findings cannot be generalised to any other area because the sample was not large enough. Secondly, the respondents were often very busy with customers at the time when the survey was carried out due to the demanding nature of their businesses. It is possible that this may have potentially compromised their responses. Lastly, time and financial constraints restricted the researcher to focus on a limited scope of the technical research, leaving more questions that could be answered through future research. Taking into consideration the limitations this technical research had, it therefore recommends that this report and its findings be used as a foundation for future research on this topic to include other mobile devices such as speed points and mobile banking devices to determine their impact on small businesses. Furthermore, it is recommended that a similar study is done using a larger sample to assess whether a similar study would arrive at the same findings and confirm this study’s conclusions. This would similarly enable the generalisation of these findings to be applicable to the population. Lastly, further probes should be done into the productivity and profitability impacts of mobile technology in small businesses. I would like to express my gratitude to all the small business owners in Noordwyk who participated in the survey, had it not been for them, this report would simply be non-existent. Ajzen, I, M.F. (1977). Attitude-behavior relations: A theoretical analysis and review of empirical research. Psychological Bulletin, 84, 888-918. Ajzen, I. (2002). Perceived behavioural control, self-efficacy, locus of control and the theory of planned behaviour. Journal of Applied Social Psychology, 32, 1-20. Akmaliah, Z., Pihie, L., & Bagheri, A. (2010). Entrepreneurial attitude and entrepreneurial efficacy of technical secondary school students. Journal of Vocational Education & Training, 37-41. Allen, P.J., & Bennett, K. (2010). PASW statistics by SPSS: A practical guide. Cengage Learning. Amin, M. (2015). Ministry of Education and Culture: Almost All Graduates of Vocational Schools Absorbed by the World of Work. Autio, E.H., Keeley, R., Klofsten, M., GC Parker, G., & Hay, M., (2001). Entrepreneurial intent among students in Scandinavia and in the USA. Enterprise and Innovation Management Studies, 2(2), 145-160. Bandura, A. (1997). Self-efficacy: the exercise of self-control. New York: Freeman. Barral, M.R.M., Ribeiro, F.G., & Canever, M.D. (2018). Influence of the university environment in the entrepreneurial intention in public and private universities. RAUSP Management Journal, 53(1), 122-133. Bruff, D. (2009). Teaching with Classroom Response Systems: Creating Active Learning Environments. Jossey-Bass: San Francisco, CA. Buchari, A. (2009). Entrepreneurship. Bandung: Alfa Beta. Carswell, D.R., Rae, D., & Carswell, M. (2006). Using a life-story approach in researching entrepreneurial learning: The development of a conceptual model and its implications in the design of learning experiences. Education+Training, 42(45), 220-227. Collins, L., Hannon, P.D., Smith, A., Collins, L., & Hannon, P.D. (2008). Enacting entrepreneurial intent: The gaps between student needs and higher education capability. Education and Training, 46(8/9), 454-463. Dinis, A. (2013). Psychological characteristics and entrepreneurial intentions among secondary students. Education & Training, 55(9), 763-780. Fang., & Zhao. (2005). Exploring the synergy between entrepreneurship and innovation. International Journal of Entrepreneurial Behavior & Research, 11(1), 25-41. Fayolle, A., Liñán, F., & Moriano, J.A. (2014). Beyond entrepreneurial intentions: Values and motivations in entrepreneurship. International Entrepreneurship and Management Journal, 10(4). Fuchs, K., Werner, A., & Wallau, F. (2008). Entrepreneurship education in Germany and Sweden: What role do different school systems play? Journal of Small Business and Enterprise Development (JSBED), 15(2), 365-381. Hair Jr., J.F., Black, W.C., Babin, B.J., Anderson, R.E., & Tatham, R.L. (2006). Multivariate data analysis (6th ed.). New Jersey: Prentice-Hall, Inc.
Harris, M.L., & Gibson, S.G. (2008). Examining the entrepreneurial Attitudes of US business students. Education & Training, 50(7), 568-581. Heinonen, J., & Poikkijoki, S. (2006). An entrepreneurial‐directed approach to entrepreneurship education: Mission impossible? Journal of Management Development, 25(1), 80-94. Holmgren, C., & From, J. (2005). Taylorism of the mind: Entrepreneurship education from a perspective of educational research. European Educational Research Journal, 4(4), 382-390. Hu, L.T., & Bentler, P.M. (1995). Structural equation modeling. Concepts, issues, and applications. In R.H. Hoyle (Ed. ), Evaluating model fit. London: Sage. Hu, L.T., & Bentler, P.M. (1999). Cutoff criteria for fit indexes in covariance structure analysis: Conventional criteria versus new alternatives. Structural Equation Modeling: A Multidisciplinary Journal, 6(1), 1-55. Janssens, W., Wijnen, K., Pelsmacker, P.D., & Kenhove, P.V. (2008). Marketing Research with SPSS. Prentice Hall, Upper Saddle River, NJ. Katarina, D. (1993). Korelasi antara self efficacy dengan kinerja tugas Karyawan Bagian Pengelasan di Divisi G.E.PT.PAL Indonesia Surabaya. Unpublish Thesis. Fakultas Psikologi, Universitas Airlangga, Surabaya. Khuong, M.N., & Nguyen, HA. (2016). The Factors Affecting Entrepreneurial Intention of the Students of Vietnam National University-A Mediation Analysis of Perception toward Entrepreneurship. Journal of Economics, Business and Management, 4(2). Khuong, M.N., & An, N.H. (2016). The factors affecting entrepreneurial intention of the students of Vietnam National University-A mediation analysis of perception toward entrepreneurship. Journal of Economics, Bussiness and Management, 4(2). Kundu, S.C., & Rani, S. (2008). Human resources’ entrepreneurial attitude orientation by gender and background: A study of Indian Air Force trainees. International Journal of Management and Enterprise Development, 5(1), 77. McClelland, D.C. (1961). The achieving society. Princeton: D. Van Nostrand. Obschonka, M., Silbereisen, R.K., Cantner, U., & Goethner, M. (2015). Entrepreneurial Self-Identity: Predictors and Effects within the theory of planned behavior framework. Journal of Business and Psychology, 30(4), 773-794. Liñán, F., & Chen, Y. (2009). Development and cross-cultural application of a specific instrument to measure entrepreneurial intentions. Entrepreneurship Theory and Practices, 33(3), 593-617. Luca, M.R., Cazan, A.M., & Tomulescu, D. (2012). To be or not to be an entrepreneur. Procedia-Social and Behavioral Sciences, 33, 173-177. Luis, J., & Campo, M. (2010). Analysis of the influence of self-efficacy on entrepreneurialintentions. Prospectiva, 9(2), 14-21. Peng, Z., Lu, G., & Kang, H. (2012). Entrepreneurial intentions and its influencing factors: A survey of the university students in Xi’an China. Creative Education, 3(08), 95-100. Piperopoulos, P., & Dimov, D. (2015). Burst bubbles or build steam? Entrepreneurship education, entrepreneurial self-efficacy and entrepreneurial intentions. Journal of Small Business Management, 53(4), 970-985. Purwana, D., & Suhud, U. (2017). Entrepreneurship education and taking/receiving & giving (TRG) motivations on entrepreneurial intention : Do vocational school students need an entrepreneurial motivator? International Journal of Applied Business and Economic Research, 15(22), 349-363. Puspayoga. (2017). Entrepreneurship ratio target Reached 4. Public Relations of the Ministry of Cooperatives and SMEs. Robinson, P.B., Stimpson, D.V., & Huefner, J.C. (1991). An attitude approach to the prediction of entrepreneurship. Entrepreneurship Theory and Practice, 15(4), 13-30. Sarwono, S.W.E.A.M. (2009). Social Psychology. Jakarta: Salemba Humanika. Schwarz, E.J., Almer-Jarz, D.A., & Wdowiak, M.A. (2006). A structural model of entrepreneurial intent among students: Findings from Austria. Diversity in Entrepreneurship, 29-43. Setiawan, Y. (2017). Ministry of industry: Industry ready to absorb graduates from vocational schools. Shinnar, R.S., Hsu, D.K., & Powell, B.C. (2014). Self-efficacy, entrepreneurial intentions and gender: Assessing the impact of entrepreneurship education longitudinally. International Journal of Management Education, 12(3), 561–570. Soria-Barreto, K., Honores-Marin, G., Gutiérrez-Zepeda, P., & Gutiérrez-Rodríguez, J. (2017). Prior exposure and educational environment towards entrepreneurial intention. Journal of Technology Management & Innovation, 12(2), 45-58. Tabachnick, B.G., & Fidell, L.S. (2007). Using multivariate statistics (5th ed.). Boston Pearson/Allyn & Bacon. Thomas, A., & Mueller, S. (2000). A case f or comparative entrepreneurship: Assessing the relevance of culture. Journal of International Business Studies, 31(2), 287-301. Vuong, M., & Brown-Welty S, ST. (2010). Effect of self-efficacy on academic success of first generation college sophomore students. Journal of College Student Development, 51(1), 50-64. Wibowo, A., Saptono, A., & Suparno. (2018). Does teachers’ creativity impact on vocational students’ entrepreneurial intention? Journal of Entrepreneurship Education, 21(3). Wilson, F., Kickul, J., & Marlino, D. (2007). Gender, Entrepreneurial Self-Efficacy, and Entrepreneurial Career Intentions: Implications for Entrepreneurship Education. Entrepreneurship Theory and Practice, 31(3), 387-406. Wyk, R., & Boshoff, A.B. (2004). Entrepreneurial attitudes: A distinction between two professional groups. South African Journal of Business Management, 35(2), 33-38. Zhao, H., Hills, G.E., & Seibert, S.E. (2005). The mediating role of self-efficacy in the development of entrepreneurial intentions. Journal of Applied Psychology, 90(6), 1265-1272.